This maple roasted beets and carrots recipe is an easy, colorful, and healthy side dish. Perfect for your holiday table! Only 5 everyday ingredients are needed for this tasty recipe. I figured I’d make a standard roasted beets recipe better by adding in carrots. I love carrots. I made this beets and carrots recipe for Canadian Thanksgiving. I slightly overcooked it, so I took 5 minutes off the recommended cooking time in the recipe below. They weren’t mush, but I do prefer my veggies to be more tender-crisp than soft. The family liked this recipe, so that’s good. There really isn’t much to this beets side dish, which is great when you’ve got plenty of things on the go. Coat the beets and carrots in some olive oil, roast them, take them out of the oven and add some butter and maple syrup, pop them back in the oven for a bit, and you’re done. 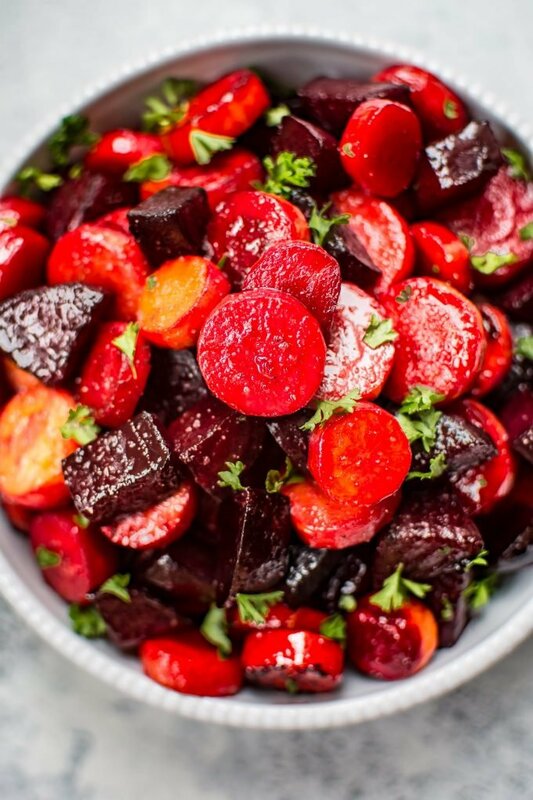 Hope you love this oven roasted beets and carrots recipe! Want to do just carrots? Try my maple roasted carrots. If you love sweet roasted carrots, you may also like my honey roasted carrots recipe. I also have an Instant Pot honey butter carrots recipe you may like. This maple roasted beets and carrots recipe is an easy, colorful, and healthy side dish. Perfect for your holiday table! Preheat oven to 425F and move the rack to the middle position. Cut the beets and carrots into pieces that are roughly the same size, and place the pieces on a large baking sheet. Drizzle the olive oil onto the beets and carrots and add salt & pepper. Toss until they're coated. Spread them out in an even layer. Roast for about 15 minutes, or until they veggies are tender-crisp (this will vary depending how big the pieces are). Take the baking sheet out of the oven and add the butter and maple syrup directly to the baking sheet. Let the butter melt then toss it again until everything is coated. Return the baking sheet to the oven for another 5 minutes. Love beets? Try my roasted beet hummus or my spiralized beet salad. Omg you actually made two recipes in a row for me. These can’t be beet. Are you making them for Christmas for me? Yum! This is what I call a nutrient-dense bowl, Natasha! Perfect recipe for autumn and the cold weather. Keep up the awesome job! juat tried it, it was fabulous thank you!! This looks scrumptious! Don’t Have maple syrup on hand, but i do have organic honey… How do you think that would taste? Too sweet? Tried this last night. It was delicious!!! Will definitely make this again. Now to peruse some of your other recipes…. Can these be made day before?? I think that would work fine, but I haven’t tried re-heating them. Hope you enjoy the recipe! I have re-heated them and it has worked just fine but I don’t cook any longer than needed so they are tender but not mushy. I have also made large batches and frozen them in individual serving size bags so I can pull out as a side for lunches. My daughter and husband devoured the beets and they are not a fan of beets! So easy, so good, don’t change a thing! I served them with grilled pork chops! That’s great! So happy it worked out! These have become a family favourite in our house – we have used traditional beets, candy cane beets and golden beets as well as heirloom carrots and all taste delicious!! Super easy – great colours to add to a meal. Do I boil the beets first? Nope. They roast at a similar rate as the carrots. Just roast them until they’re tender crisp. Just made these. So delicious and easy to make. Thank u. Do I need to peel the beets first? I’m planning on making a double batch of these next weekend has anyone tried keeping them warm in a crockpot for about an hour? Im making them for Thanksgiving but it’s not at my house so need to transport and keep warm for a bit. I think that would work, Pamela. I just wanted to come back and let you know these were a huge hit at dinner last night. I almost tripled the recipe and roasted the veggies separately. After roasting I put all Ina large crockpot and took over to the in-laws. I then put the butter and maple syrup and mixed and it was probably another 30 minutes before we had dinner. I had them on the warm setting. They were really delicious and everyone liked them! Thanks for letting me know! I’m so glad it worked. Happy thanksgiving! Great side dish. Very quick and tasty way to enjoy hearty root veggies. Thanks! Very happy to hear that you liked it, Kirk! Hey! Looking to make these.. are the beets supposed to be boiled/cooked already before putting them in the oven? I’ve never peeled uncooked beets before so just checking haha! Hi Leonie! Nope, I peel them raw. 🙂 Hope you enjoy the recipe! If i wanted to add in mini red skin potatoes, would the roasting time still be the same? Hi Lisa, I have a feeling the potatoes may take a little longer, so I’d give them a head start. I’d probably cut them in half and give them a 10 minute head start, but I haven’t tested this. Let me know how it goes! These were super delicious. I used fresh carrots and frozen sliced beets and it wonderful. My new favourite veggie dish. Thank you for this recipe. This was a easy side dish, the family loved it. It’s my wife’s new favourite veggie dish. Oooh that sounds yummy! I love purées. My mom makes an awesome one with celery root. Hope you’ll like this recipe, Amy! I would like ur purée recipe! Is that parsley on them in ur photos? I don’t notice it on the ingredient list???!!! Looks so yummy can’t wait to try!!! Do you think butternut or acorn squash could be added? I do! I think timing would still be similar. 🙂 Happy Thanksgiving! Made this last night everyone loved it- even though I forgot the maple syrup 😬 the grandkids loved it- definitely will make it again ! Haha that’s funny. I’m glad it still worked out! OMG… made this for my wife and I for our Annual New Year’s Eve dinner… will be a permanent addition… sooo good! Thanks for sharing the recipe. I just discovered you! I’m excited to give this a try tonight along with your creamy garlic chicken. Not a fan of beets. I juice them and they’re pretty tough to get down, however, my husband and I are trying to eat better and your recipe and the comments convinced me to go for it! I’ll let you know! I hope you like the recipes! I feel the same way about beets. I just can’t quite make myself love them, but I do occasionally eat/drink them for health reasons. Yum!! Made it for the first time last night and loved it, and I don’t like beets! I’m so pleased to hear it, Cassie!